The AMAC Foundation works alongside AMAC and is dedicated to advancing minorities and women pursuing careers in the aviation industry. The Foundation develops educational programs, scholarship and mentorship opportunities, and shares information to support aviation and airport industry professionals, from college students beginning their careers to seasoned professionals. 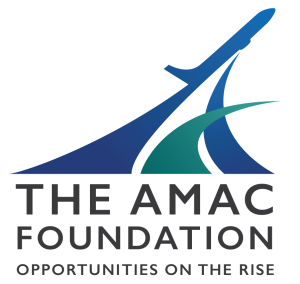 Since its establishment in 1997, the AMAC Foundation has awarded more than $350,000 in scholarships for students around the country, supporting students pursuing a broad range of careers in airports, airlines, the federal government, and private sector. To support our efforts furthering minorities and women as aviation professionals, make a tax-deductible donation or consider a corporate sponsorship. To provide minority and women students with access and equality to enter the aviation and aerospace industries. educating the general public on air transportation, airports, airport operations and facilities management. Our goal is simple: connect eligible students enrolled in aviation-related and business programs with AMAC members. Throughout the year these hands-on learning sessions are held for high school and college students to meet, connect and learn about aviation-related and business programs. AMAC’s annual Airport Business Diversity Conference provides unique opportunities for students to network with professionals around the country and learn about the aviation industry’s role in our communities. Key events at the annual conference support the AMAC Foundation and Scholarship Fund. A cornerstone event of the annual conference, this tournament provides networking with conference attendees, local golfers and key sponsors. This event highlights dynamic women who have made great contributions in the aviation industry. This auction features exclusive items, packages and drives the excitement behind fundraising at our annual events.